UCSD psychiatrist Joel Dimsdale recalls the day an executioner came for him four decades ago at his Massachusetts General Hospital office. A man rapped on his door, carrying a gun case. But the gun case turned out to be a document case, and the papers were the visitor’s — as the Nuremberg hangman of Nazis after World War II. So Dimsdale did, and the result is “Anatomy of Malice: The Enigma of the Nazi War Criminals” — a book being published in May by Yale University Press. Using 21st century diagnostic tools on four long-dead Nazi war criminals — Robert Ley, Hermann Göring, Julius Streicher and Rudolf Hess — Dimsdale conducted a detailed examination. The resulting psychological portraits depict a surprisingly broad spectrum of pathology. 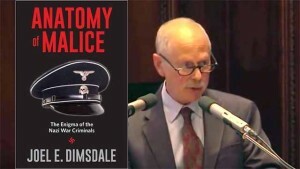 Some 11 million civilians — including enough Jews who laid head-to-toe would reach from San Diego to Berlin, he says — perished in the Holocaust, Dimsdale notes. When the Allies convened the international war crimes trial in Nuremberg, American psychiatrist Douglas Kelley and psychologist Gustave Gilbert conducted extensive psychiatric interviews, IQ tests, and Rorschach inkblot tests, in an attempt to grasp and shed light on the psychological profiles of the Third Reich leadership. A distinguished professor emeritus in the Department of Psychiatry, Dimsdale will discuss and sign copies of his book on Thursday, May 12, at a talk sponsored by the UC San Diego Library.